In a Kingdom far, far away from that of hard ciders and red wine existed a beautiful countryside, covered in the grandest Blue Agave plants that anyone had ever seen. But today was a different story. As a historian my travels have taken me many places, but I have longed to visit the Agave Kingdom. My plans were continually way-laid as their civil war was fought over two decades, but now, with it at an end, I am able to set eyes on this land and its people for the very first time. As the first outsider to visit the newly restored Kingdom, a most handsome citizen named Milagro greeted me warmly at the Kingdom’s Beautiful outskirts. He was tall and thin, his hair white and his outfit a dark blue. I could tell immediately, from his very smell that he was a Tequile, or a member of the upper class. What I knew of the Agave Kingdom had either come from books or 1st hand accounts of friends and family. I knew the Tequiles made up the upper class of society and the Coronas, the lower, and much poorer class. The Coronas greatly outnumbered the Tequiles, but were kept in place by the Patron Prince and Princess, brother and sister. They owned all the beautiful agaves, which allowed them to stay in power. Upon entering the main city there was a hustle and bustle that simply does not exist in my homeland of Chivas Regal. In my homeland it feels like everyone is sitting around for 12-21 years doing nothing but growing older. Here though, everyone was moving! The walls of the houses were constructed from amazing cerulean blue tiles. Small shops existed between houses and while I’m unsure of the material used to construct them, they were each uniquely decorated in bright colors. Before I say more about the citizenry- I should note that not 50 yards into the center of the city we were met by a small welcoming party. Milagro bid me a due and I found myself in the company of the new members of the inner circle & Queen Patron herself. The Queen was much shorter in height and wider around than the company she kept, but upon seeing her none of that really occurred to me. She exuded a confidence that left no doubt that she was the one in charge and possessed a coloring unlike any other I’d ever seen- almost as though she could glow. She immediately grabbed my arm and linked it with her’s- decidedly ignoring her party and the requisite introductions. As we neared the palace we heard a very un-palatial sounding song playing outdoors. 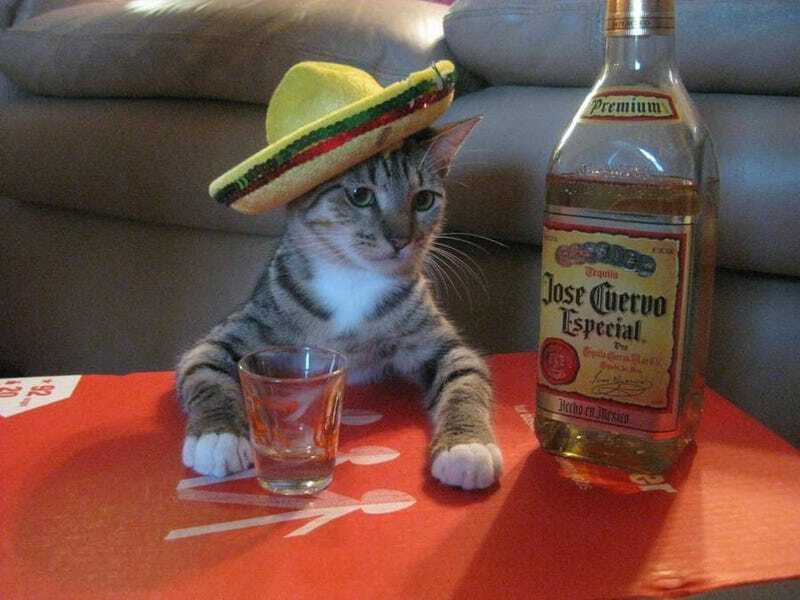 “Más Tequila! !” marked the end of the song and the Queen was quick to point to the fact that it was in fact Prince Patron’s music. I wondered how much stock one could put into music being a sign of progress in a newly healed land. ‘Más Tequilla’ had been frequenting the radio waves that reach all parts of Boozatopia, but I knew a Cabo Wabo wrote it. Cabo Wabos were kicked out of Tequile Society years ago; it is believed that the reigning King was angry with the Cabo Wabo in Van Halen, but it is only speculation. Were the boundaries of the Agave society fluid once again? Was there no longer a specific upper and lower class? Will Milagro tell me all his secrets while we make out? Is there really a 3 Tequila shot limit? Will Milagro and I find out? These questions answered and more on the next episode of THE ALCOHOL WARS.